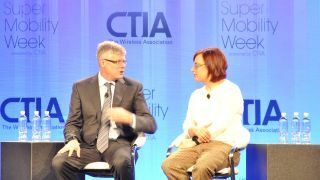 Eight billion new smartphones will be sold in the next five years worldwide, said Qualcomm CEO Steve Mollenkopf at CTIA 2014 in Las Vegas. Despite an increase in smartphone production, Mollenkopf said developer attention is branching out beyond phones to wrists, cars, and healthcare data. However, he said the phone is still the central hub of what consumers use to interact with the outside world. "We always thought the phone was more important to take [out of the house] with you than your wallet," he said. "But in the future the phone will also be a hub for your medical data." Qualcomm is focused on high and low-end smartphones, Mollenkopf said. However, worldwide he said low-end smartphones will be able to penetrate markets more easily. Qualcomm shipped 750 million units last year. The company is trying to bring smartphone technology into adjacent markets, such as automotives and wearables. Last year, Qualcomm launched the Toq, a 1.6-inch display smartwatch. "You're in a spot where there's a tremendous amount of experimentation [with wearables]," he said. "Everyone has this gut feel that there's something there. Everybody has interesting-looking products. We're believers in the wearable craze." However, Mollenkopf said Qualcomm is not in the smartwatch business. Mollenkopf said battery life technology is improving, but not at the rate of other device technology. Instead, he said Qualcomm is focused on developing ways to charge devices as battery life technology improves. Qualcomm is working on broadband capacity issues. Mollenkopf said Qualcomm is spending a lot of time figuring out ways to improve spectrum. "Carrier aggregation has been launched worldwide," he said. "You tend to see high-end modem features coupled with high-end wifi features. The importance of offloading things the proper way is driving a lot of momentum and velocity on the features we're driving with the modem." What does TechRadar think of the Qualcomm Toq?